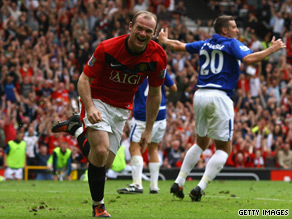 Wayne Rooney showed his determination to fill the void left by Cristiano Ronaldo as Manchester United began their English Premier League title defense with a 1-0 victory at home to promoted Birmingham on Sunday. The England striker netted the only goal in the 34th minute — his 99th for the club — after starting up front in a more central role than last season along with Dimitar Berbatov. Rooney combined with the Bulgarian to set up Nani on the left, and rose above Franck Queudrue to head the subsequent cross against goalkeeper Joe Hart’s post before stabbing in the rebound. United dominated the match against a side who returned to the top flight just one season after relegation and showed that they will battle all the way to retain their status. However, the guile and penetration of Real Madrid’s world-record signing Ronaldo was noticeably lacking. United were also missing England defender Rio Ferdinand, who was forced to pull out with a thigh injury and is expected to be sidelined for two weeks. United boss Alex Ferguson gave surprise summer capture Michael Owen his league debut, with the former England striker unable to make much impact after replacing Berbatov in the 74th minute. Birmingham manager Alex McLeish gave club-record signing Christian Benitez his first taste of action in England at the same time, and the Ecuador forward forced a fine save from Ben Foster after beating the offside trap.